Georges St-Pierre has retired and Ultimate Fighting Championship (UFC) president Dana White took the time to reflect on “Rush’s” career. To some, St-Pierre is the greatest mixed martial artist of all time. “Rush” had nine consecutive successful title defenses in his second run as the UFC welterweight champion. He also captured the UFC middleweight title in the final bout of his professional MMA career. 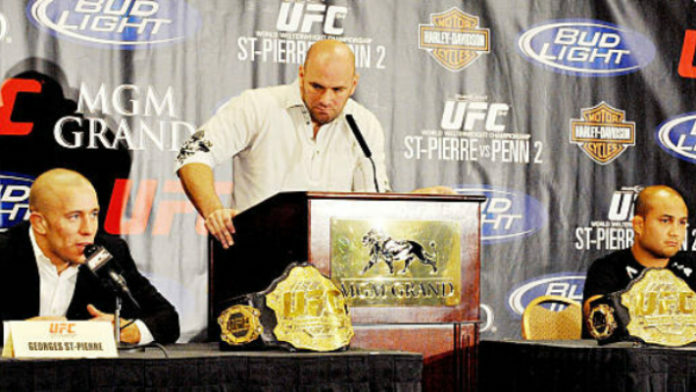 Earlier today (Feb. 21), St-Pierre announced his retirement during a press conference. St-Pierre closes out his MMA career with a 26-2 record. His only losses were to Matt Hughes and Matt Serra. St-Pierre avenged both defeats. He has the third most consecutive title defenses in UFC history, trailing Demetrious Johnson and Anderson Silva. Do you think Georges St-Pierre could do business with the UFC outside of fighting?